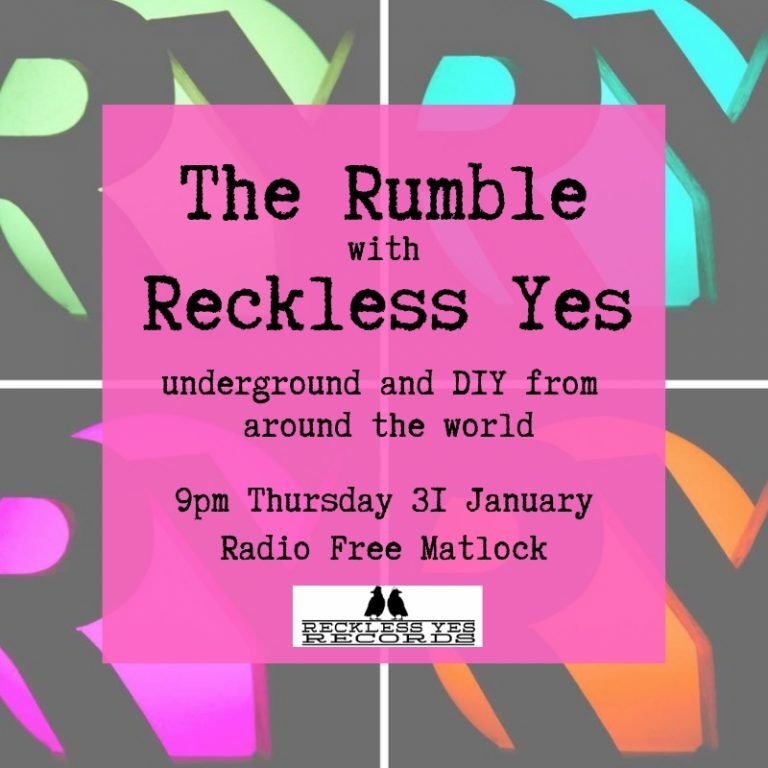 To top off what has been a bumper week of announcements we’re pleased to share that Reckless Yes has joined Radio Free Matlock for the return of The Rumble. Started by Pete Darrington in 2015 for Radio Andra The Rumble was a weekly show championing and celebrating the best of underground and DIY music from around the world. In 2016 Sarah Lay began contributing a recommendation each show, on behalf of Louder Than War where she was then editor. It was the first thing we worked on together, and the fertile land from which Reckless Yes sprung forth. We both loved that show and discovered so many new bands through putting it together but by the end of 2016 a combination of Radio Andra going off air and the label getting increasingly busy it was inevitable we needed to take a break. Radio Free Matlock is run by an awesome group of people – among them Ash and Lucie from the ace Damn Cargo – and in many ways is a natural home for Reckless Yes with some of the RY Fam already contributing shows (check out this documentary about being a musician by Robin Newman of Mighty Kids, Grawl!x and Snug Recording, with Sarah Lay interviewing Haiku Salut and Grawl!x as well as Grawl!x’ regular interview show Rough Mix). When they asked if we’d like to get back on air it was time for a reckless yes of our own, to dust off The Rumble idents and clear our radio voices. We’ll be on air for an hour on the last Thursday of the month, starting at 9pm on Thursday 31 January 2019. The show is recorded at Snug Recording Company, produced by Sarah Lay, edited by Peter Darrington and presented by us both. You can tune in to Radio Free Matlock, or you’ll be able to listen again via Mixcloud and find a full list and links to what we played each show here on the site. In our comeback episode we’ve got music from England, Scotland and Ireland, from the Netherlands, Myanmar, Sweden, Australia and the USA. We bring you a classic album track and a featured artist and music is from a mind-bending array of genres including indiepop, noise rock, experimental, and electro. There’s even some stuff we – brilliantly – don’t really know how to categorise! If you’d like to catch yourself up the last few episodes of the original Rumble are available as a podcast here. If you’d like to submit music for us to consider playing on the show please check our demo submission information and send it to us that way. listen to our roster on Spotify.